St. Augustine said “The world is a book and those who do not travel read only one page.” The page we read in the U.S., describes intolerance for the name of Jesus in schools and a general disdain for anyone who pursues the Holy Spirit. What a small team of ministers found written over the island of Taiwan is very different. John Wen led a team of Texans to the other side of the world. They are the type of people foolish enough to believe they could start a move of the Holy Spirit in a vastly Buddhist college. A perfect group for an interesting trip. My name is Jeremy Shuck, and I was part of that group. Here’s the break down… We had a week of unsupervised contact with over one hundred unsaved college freshman. It was required for them to attend our English classes, where we could talk about Jesus with no objections from the school authorities! Additionally, the students had to attend our evening sessions where the worship band would play and the gospel would be preached. What a set up for crazy things to happen! Right away we noticed how the Taiwanese people are very spiritual. Temples every where, incense smoke-filled shrines on the side of the road, taxi cabs with little Buddha dolls glued to the dash board; it was hard to miss. They were dedicated to praying to chunks of wood, thinking them to be gods. Oppressed and held captive by the very thing they hoped would set them free. What these people really need is an experience with a Spirit, Who will answer when they call. So, that was our objective… introducing them to the Holy Spirit. The students were very excited to hang out with guitar-toting white folk. We had no trouble gaining their attention. In classes, we taught conversational English and basic skills, such as cooking, dance, and drama. After we got to know our students and began having fun with them, we started telling them about Jesus. Surprisingly they were very interested. It was nothing like a US school, where people roll their eyes, or scatter when Jesus is mentioned. We prayed for healing, we saw tears, we felt hearts opening in students who feeling the true love of God for the first time. At night we worshiped the Lord as well as we knew how. The students danced. By the end of the week, a dozen or more kids believed and called on the Name of Jesus. On the last night, we received accurate prophetic words of knowledge for strangers in the meeting, which no one over there had ever experienced before. Eye sight was healed, arthritis was healed, insomnia was healed. Tears of emotional healing were shed by many. We invited people to come forward for personal prayer and long lines formed. We prayed for hours and people waited. They were hungry for true food from heaven. Since we left, the Christian Fellowship on campus has doubled. The Holy Spirit brought a fresh wind of strength and passion. The school has asked us to come back next year, because they had the greatest response from the students when asked about the English classes. Jesus opened a door that no man can shut. Thank God for answering all our ten prayer requests. He strengthened us to work from morning till night, teach English camp during the day and lead students to worship God during the night. Although we were very exhausted every day, but no one became sick and everyone was joyful and filled with the Holy Spirit. On the second day, the university told me that the students felt being loved by us. 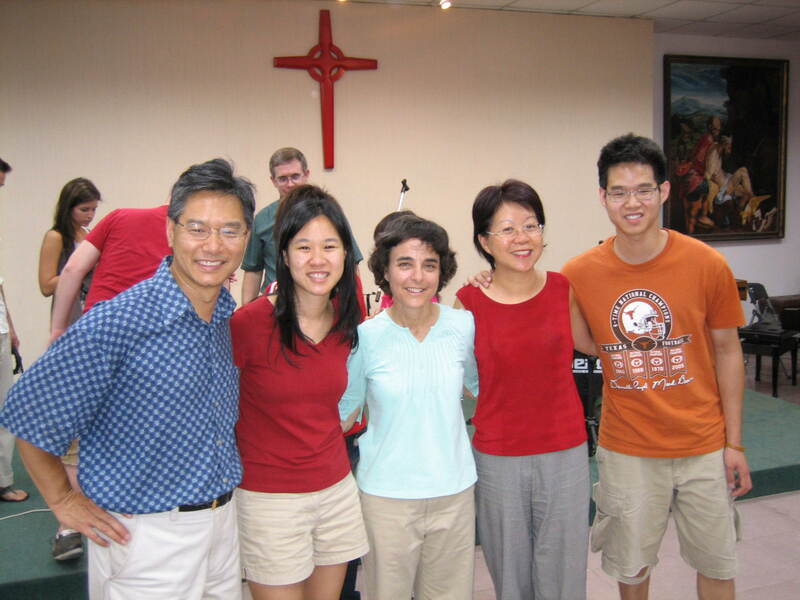 I also want to thank God for uniting us from seven different churches through Him, and under one Lord, one faith and one baptism to work together for the gospel to extend His kingdom in Taiwan. Praise the Lord! We had twenty plus new believers, at least three persons were healed and many more were greatly comforted by the prayer ministry after worshiping God. There were many wonderful testimonies during our mission trip; I’d like to share with you just one to praise His wonderful faithfulness upon us. Back in May I was touched by God to bring a worship team to Taiwan to praise His name above all other gods there. I didn’t know a worship team wanting to go. One day in my prayer, I said to God that I’d rather giving up our four and half star, luxury hotel accommodation to save money for supporting a worship team. Soon afterwards, a worship team from a local American church, Wellspring church, told me that they were willing to go, and will try to raise fund as well. It turns out that God had long ago prepared this worship team for mission Taiwan. But Satan started to work overtime to block this. First, just two weeks before the trip, the Bass guitar player can’t go. I searched for a replacement in vain, unexpectedly I found out one of the mission members played guitar, and furthermore he also had this special Bass guitar. It turned out that God had long ago prepared this Bass guitar player from Houston Chinese Church. And then, just three days before our departure, suddenly I discovered that our drummer’s ticket got canceled after examining his four page long ticket. I called the travel agency to find out that it was their mistake of forgetting to buy a new ticket after a name correction, instead, issuing me a canceled ticket with a correct name on it, that misled me to think I have received the right ticket all along. But only three days to go, there was not a single ticket can be found at such late. I dropped in despair, and cried out to God to let us still be able to worship Him. After praying, I felt peace in me, then I called the travel agency again to find me a ticket. After a long hold, the agent shouted out that a ticket just became available. But for a long while I was afraid to ask about the price, what if a high price for the first class ticket? Finally I did, and they told me the same old price. It turned that God had long ago prepared this last minute ticket for our drummer. Upon arriving at the university, the worship team found out the horrible condition of the sound system. After more than three hours of trying to set it up, its sound quality was still poor. At this time, I can only pray to God to behold the sound system so that we can still worship Him. The next morning, Rev Mike Miller of SBC stationing in Kaoshiung came to meet me. We were all excited to meet each other the first time, and happily talking about praising God to let Him touch students so we can outreach them afterwards. I then mentioned to him about our team spending so much effort last night trying to set up the poor sound system. Although the sound quality was still poor, but nobody complained, and even taking a taxi all the way to find a music store in a large city nearby late into the night, trying to buy some sound equipments themselves. And then, I asked him to pray for the sound equipments not getting worse. Out of sight, he drove couple hours all the way back to Kaohsiung and brought back a black box two hours later. It was compact but very heavy. He told me that he didn’t know how to use it, and had no idea if it can be used with our guitars. That was a gift from an American mission team when they left Taiwan just this past May. He thought to bring it over for us to try it out. Soon our worship team saw this, setting up the box and connected all their equipments to it. Almost instantly it worked and played perfectly great music, just in time for the first night’s worship. Afterwards, we used this sound system to worship God every night. It turned out that God had long ago prepared this wonderful sound system for us to worship Him, not just a simple sound amplifier. I turned out that God had long ago prepared a Bass guitar player for the worship team. It turned out that God had long ago prepared this last minute airline ticket for our drummer to make the trip. It turned out that God had long ago prepared this worship team for mission Taiwan. It turned out that God had long ago wanted us to worship Him first, outreached students later, and then He will use signs and wonders to extend His kingdom in Taiwan. Praise the Lord, His faithfulness turns out to be indeed truly wonderful and great upon us. Praise the Lord, Amen. This entry was posted in Mission Taiwan 2007 sharing (English and Chinese). Bookmark the permalink.